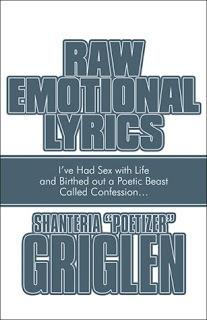 Things to do before you die: New Book--Official Release of "Raw Emotional Lyrics"
New Book--Official Release of "Raw Emotional Lyrics"
So I mentioned this earlier, but now I can make the "official" announcement. A really good friend of mine named "Poetizer" just got her first book of poetry published. After months and months of hard work--it is DONE! The book is called "Raw Emotional Lyrics." "...My transgressions have been buried in the depths of the earth. The dead skin of life's tribulations has shredded from my thoughts poem by poem leaving a trail of matured wisdom, a vision guided by spiritual reflection and filtered into a soul of purpose. I've carried my cross. My burdens weren't mine to bear. I had to fulfill this task so that others wouldn't have to see themselves in a place of uncertainties, confusion and darkness. I survived life after death…so will you!" I highly recommend it! Check out the link from the publisher. congrats on knocking that out. i know what it's like to have a long project to work on. finishing it is the best feeling in the world.